Home > Alice Gerstenberg > Events > HE SAID & SHE SAID > Nigerian Theatre > Stage Play > Theatre > Theatre Republic > #StagePlay: B/Rated Production stages Alice Gerstenberg's "He Said & She Said"
#StagePlay: B/Rated Production stages Alice Gerstenberg's "He Said & She Said"
Do you have plans for December 30th & 31st? Here's something you should consider doing with your friends. B/Rated Productions will be staging ALICE Gerstenberg's HE SAID & SHE SAID. Exposing a common social vice through wry dialogue, HE SAID & SHE SAID is a satire highlighting how much damage one can suffer from listening to the wrong people. Enid invites two friends, Mrs. Packard and Diana, to dine with her and her husband Felix. However, upon arriving, Mrs. Packard has a piece of gossip for Enid about Diana that threatens to ruin the night and to end friendships. She alludes to Enid that Diana is in love with Felix (Enid's husband), and in Enid's absence, alludes to Diana that Enid thinks she (Diana) is in love with Felix. Diana confronts Felix, sparking off a chain of accusations and counter accusations that almost tear lifelong friends apart. The play is humorous as the conversations are witty and suspense filled, leaving it's audience captivated and anxiously awaiting the next turn of events. 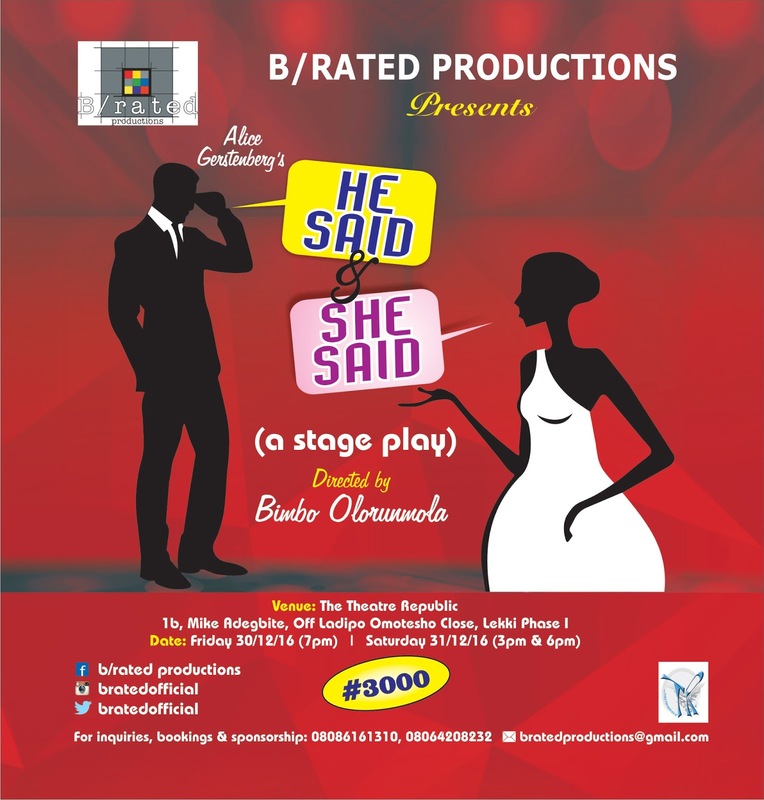 He Said & She Said is produced by B/Rated Productions in collaboration with The Theatre Republic. It is directed by Bimbo Olorunmola and features OlaRotimi Fakunle, Tosin Adeyemi among others. Venue is The Theatre Republic, 1B Mike Adegbite off Ladipo Omotesho (Beside Lagoon School) Lekki phase 1. Dates are Friday 30th & Saturday 31st December 2016. Time 7Pm Friday, 3 & 6pm Saturday.